After my latest virtual hang-out with Angela and having familiarized myself with the philosophy of the project, I have come to realize that there is scope in writing on the practicalities of working as a museum curator in Greece. This blog serves as a forum of communication between museum registrars and curators from all over the world. In this framework, let me elaborate a bit on what it means to work in a public archaeological museum in a state hampered by economic crisis. 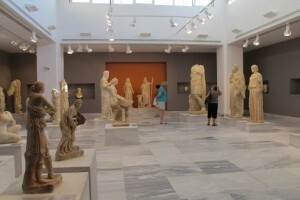 With the exception of a few museums, the New Acropolis Museum being the most famous of them, most of the archaeological museums in the country are under the jurisdiction of the newly baptized General Secretariat of Culture. This was formerly part of the Ministry of Culture and since June 2012 it belongs to the Ministry of Education, Religious Affairs, Culture and Tourism. The concept for this change was the reduction of the administrative departments within the Greek state public sector. As time goes by, this also means some form of degradation in the expectations of the members of the Greek Archaeological Service and of the museum professionals among them. The numbers speak for themselves. When Ministry of Culture still existed it always had the lowest budget among all Greek ministries. The so-called General Secretariat for Culture now has to fund most, if not all of its actions, through EU funded projects. These projects are approved and then run under strict specifications through the so-called National Strategic Reference Framework (NSRF). From their inception and throughout their implementation the museum or other archaeological projects are administered centrally on a national level. Nevertheless, in many cases they absorb as much as half of the daily energy of the involved museum curators in order to sustain the labyrinthine bureaucracy of NSRF. So aiming at more museum projects virtually means more bureaucracy and one naturally wonders where the exit of the maze can be. I have an antique vase and the inside inscription says that is from 490 BC. I would like to send pictures and I will appreciate if you could give me your opinion of its value. I’m sorry to inform you that talking about values is regarded as unethical behavior for registrars and other collections professionals in most countries of the world. Further, most professionals who can give a suggestion about values (i.e. appraisers) won’t do this on the basis of mere pictures. Sorry I can’t give you a more positive reply. As a side note, if it is really an inscription that says “490 BC” on the artifact itself, not just a label or a document I can at least inform you that it is a very rare piece. There is strong evidence that someone built a time machine, travelled back in time, made the vase and, knowing when Christ will be born, made the inscription in relation to this birth date. However, I must inform you that leading museologists suggest that in this case the date of manufacturing has to be set no earlier than the date the actual time machine was built. Schade, der Titel klang vielversprechend. Leider berichtet der Beitrag – außer andeutungsweise im letzten Satz – nicht über den Tagesablauf griechischer Kuratoren. Ein Kuratorenportait wäre schön gewesen. What a pity, the title sounded promising. Unfortunately the article doesn’t – except covertly in the last sentence – talk about the everyday work of greek curators. A portrait of a curator would have been nice. Qué lástima, el título sonaba prometedor. Lamentablemente el artículo no habla -sólo encubierto en la última oración- de la labor cotidiana de los conservadores griegos. Un retrato de un conservador habría sido agradable. Stimmt! Ein Kuratorenprortrait soll auch geschrieben werden. Aber, mein Absicht hier war zu berichten, dass unser Tagesablauf immer mehr Bürokratie auf Koste von Kultur betrifft! That’s right! A curator’s portrait shall be written, too. But, it was my aim with this article to show that our everyday work contains more and more bureaucracy instead of cultural work! ¡Es correcto! El retrato de un curador deberá ser escrito, también. Pero, que era mi objetivo con este artículo demostrar que nuestro trabajo diario contiene más y más burocracia en lugar de trabajo cultural! Da Bürokratie fast zu einem Schimpfwort degradiert worden ist, und im Grunde genommen nicht mehr Politik, EU Programme und Projekte vor Ort auseinander hält, kann solch eine Beschreibung wie in diesem Artikel leicht zu Mißverständnissen verleiten. Es stimmt allerdings daß die Kultur fast keine eigene Stimme mehr hat, aber dies ist politisch gewollt. Innerhalb des Strukturfonds hatte die Kultur noch ein eigenständiges Rahmenprogram 2000 – 2006; in der anschliessenden, jetzt zu Ende gehende Phase (2007-2013) war die Kultur bzw. das Kulturministerium nur indirekt beteiligt. In den Neuverhandlungen mit der Kommission wurde Kultur durch das seit 2009 bestehende Ministerium für Kultur und Tourismus nur indirekt vertreten. Und wie im Artikel erwähnt, gibt es heutzutage nur noch das Ministerium für religiöse Angelegenheiten, Erziehung, Kultur und Sport. Mit anderen Worten, die Frage von Identität soll nicht länger von der Kultur, sondern von der Religion behandelt werden. Premierminister Samaras setzt auf die Kirche als eine der tragenden Säulen und das neben Tourismus und Schiffsfahrt. Die Krise von Griechenland kann darum auch als Verlust an literaischer Aufklärung angesehen werden. So soll das EKEVI – Das Zentrum zur Förderung des Buches – geschlossen werden. All das deckt sich mit der Tatsache daß in griechischen Schulen kein Kunstunterricht statt findet. Wenn also Kultur derartig in den Hintergrund gerät, dann deshalb weil auch die EU Kommission nur noch die Kreativ- und Kulturwirstschaft fördern will d.h. Kultur die einen nachweisbaren ökonomischen Wert hat. So als bräuchten die Menschen keine Reflexionsmöglichkeiten ihres Selbstverständnis. Oft wird vergessen oder übersehen daß Karamalis nicht nur Premierminister ab 2004 war sondern auch Kulturminister bis 2006. Seine rechte Hand war Zachopoulos, General Sekretär des Kulturministeriums der nur ein Konzept hatte, und zwar neue NGOs zu fördern weil die bestehenden in der Mehrheit die PASOK unterstützt hatten. So vergab er Gelder auf eine Weise die das Kulturministerium außer Kraft setzte. Und er konnte das als General Sekretär leichter als ein Minister tun, weil stets unterhalb des Radarschirms von politischer Verantwortung. Somit wird das selbe Spiel weiter getrieben. Entscheidungen werden weitgehend außerhalb der Öffentlichkeit beatrieben und nur das öffentliche Gut dann in Anspruch genommen, um neue Privatisierungsprojekte zu legitimieren. Wie gesagt, noch viel mehr kann dazu gesagt werden, aber Bürokratie als Begriff reicht nicht aus um das was tatsächlich gespielt wird beim Namen zu nennen. Bureaucracy has become nearly synonymous with a dirty word but too often it is used to blame everything on it while politics, EU programmes and projects are no longer distinguished as the case in this article. Hence everything can easily become one big misunderstanding. Nevertheless it is true that culture has hardly a voice of its own, but this is due not the outcome of bureaucracy but due to a political policy being followed in Greece already for some time now. 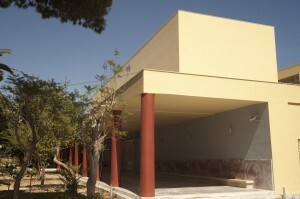 Take the example of the Structural Fund and how culture is financed in Greece, during the funding period 2000-2006, culture had its own operational program. In the current but now ending period 2007-2013, culture had not such an own programme administered by the Ministry of Culture, but at both national and regional levels two such programmes were given to Ministry as part of an agreement between various ministries. Now that negotiations with the Commission about the new funding period are under way, culture is represented only indirectly. For Papandreou formed a new ministry in 2009 to combine tourism and culture, while the current government under Premierminister Samaras created the Ministry for Religious Affairs, Education, Culture and Sport. This explains why the leading person for culture is the general secretary and not a minister, but as shall be shown this was already the case when Karamalis and Nea Democratia gained power in 2004 and Karamalis was as well Minister of Culture but in effect his general secretary Zachopoulos was in charge. These shifts in responsibilities allocated to different ministries indicates that the delicate question of identity should no longer be handled by culture, but by religion. Prime Minister Samaras has declared that the key pillars to bring Greece through the crisis are the church, tourism and the shipowners. Consequently the crisis of Greece can be understood equally as a loss of literacy with culture either only cheap entertainment or a privilege for those who can still afford going to cultural events. One indication for that is that EKEVI, the National Book Centre is going to be closed, if no resistance shall come from the cultural sector. Designed to promote the book, it was set up to facilitate both writers and publishers in coming together and to promote Greek literature abroad and through various book fairs. At the same time, the renewed influence of the church in times of crisis reflects itself a reversal of the tendency towards openness as with the return of the spirit of orthodoxy it rationalizes as well why Greek schools do not give art lessons. As if creativity outside the normed schemata is not wanted. Once culture is pushed so far into the background, then also because the EU Commission wishes to promote only the Creative and Cultural Industry since culture is only then recognized when it has a proven economic value. As if people do not need any other kind of possibility to reflect upon their own self understanding. Often it is forgotten or overlooked what happened when Karamalis and Neo Democratia returned to power in 2004, the year when the Olympic Games were held. Karamalis was not only prime minister but named himself as well Minister of Culture. He kept that dual post until 2006. The real person in charge of culture was his general secretary Zachopoulos, a former school teacher from Thessaloniki. Zachopoulos had the insight that all NGOs of the cultural sector tended to support the PASOK party, the main rival of Nea Democratia. Consequently he used the double funds available by the Ministry of Culture, namely not only the EU money for culture but as well Lotto funds, to support NGOs which would give their support to Nea Democratia. Everyone praised him for he would simply write a cheque when someone came into his office. He by passed in effect all the departments of the Ministry of Culture and therefore destroyed already the basis for any possible policy implementation in future. Zachopoulos could act like this because as General Secretary he acted below the radar screen focusing on Ministers and their actions alone. This is how taking responsibility in public can be avoided, and is a game often being played. That is now being continued but for another reason. For now any claim to be doing something in the name of the public good is used to justify some new privatisation scheme, but one which is the outcome of a crony system. In short, a lot more can be said about what and why it is happening to culture in this critical phase, but surely the term ‘bureaucracy’ does not suffice to explain what is happening. But to really name things by their true name the self understanding of culture as a search of truth has to be reactivated. Más allá de la burocracia, yo estaría infinitamente agradecida con el sólo hecho de trabajar rodeada de semejantes obras de arte. Beyond bureaucracy, I would be infinitely grateful for the sole fact of working surrounded by such works of art.